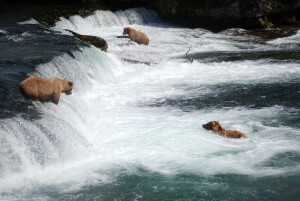 Katmai National Park and Preserve is only a short 30 minute flight from No See Um Lodge. The park is known for its vast array of diversity in volcanoes and North America’s largest population of brown bears. 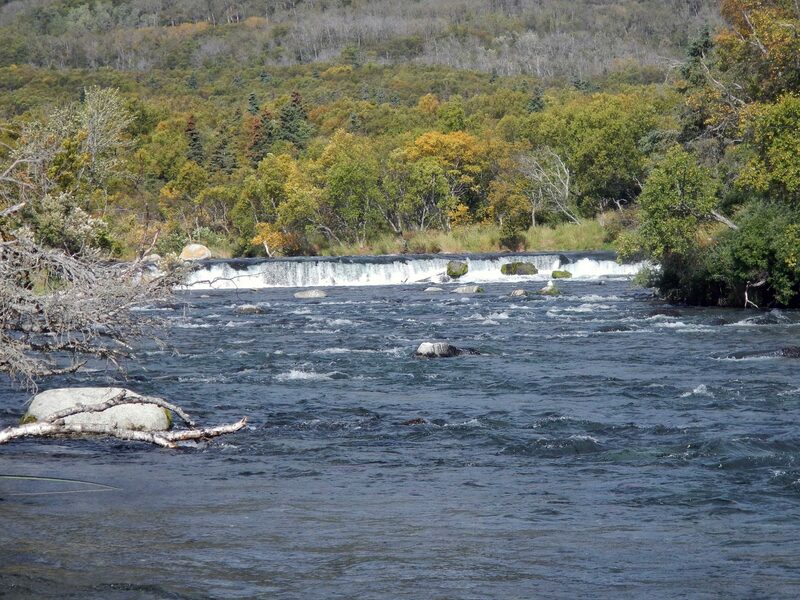 The landscape also contains hundreds of miles of rivers and streams with an abundance of Bristol Bay salmon. There are several activities to do at the park such as bear watching, backcountry hiking, fishing, exploring Brooks Camp and more. Brooks Camp is the headquarters for the National Park service in Katmai. It’s located at the mouth of the Brooks River and the shore of Naknek Lake. 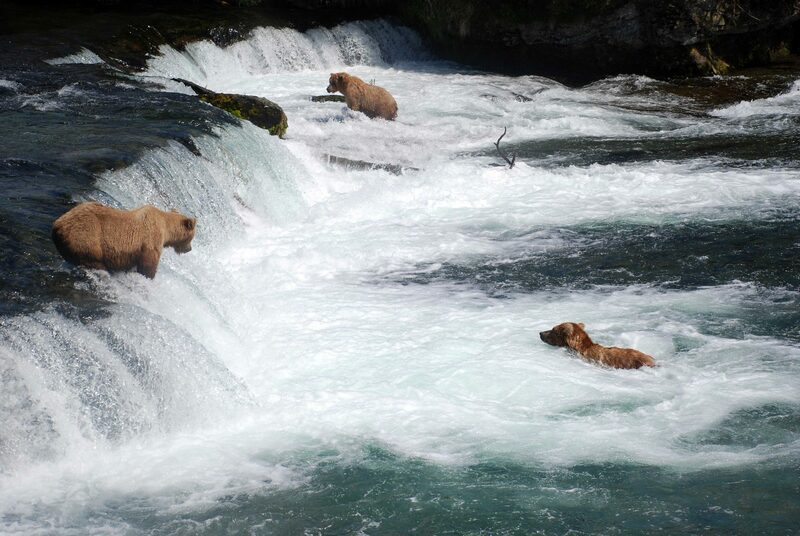 This popular destination attracts people from all over the world because of its spectacular spot for brown bear watching; Brooks Falls. Brown bears congregate there to feed on the Sockeye salmon. The camp has three wildlife viewing platforms along the river that are perfect viewing opportunities while staying safe around the bears. There are also daily bus tours from Brooks Camp for access to the Valley of Ten Thousand Smokes. Fishing in the Brooks river can be an unforgettable experience due to the large number of bears and the high density of fish. Brooks Camp is only 22 miles from the site of one of the most violent volcanic eruptions in modern history known as the “Valley of Ten Thousand Smokes”. The Novarupta Volcano erupted in 1912 that transformed 40 square miles to ash and pumice. When the ash began hardening it caused the water from below to move to the surface transforming it into steam giving the valley its new name – the Valley of Ten Thousand Smokes. Over time the steam plumes went away leaving a barren moon scape. Flight seeing the valley offers a panoramic view of the awesome power unleashed by mother nature in 1912. An alternative, close up exploration can be made via a bus tour into the valley. This is an all day excursion and requires a separate reservation, please let us know at the beginning of your trip if this is something you might like to do. Katmai has an abundance of rainbow trout, arctic char, pike, arctic grayling, lake trout (char) as well as five species of Pacific salmon available for exceptional fishing. The park and Alaska Department of Fish and Game carefully manage the fish populations so you must be familiar with the regulations. Please make sure to obtain an Alaska fishing license because it is required for everyone 16 and over. Anglers also need to be careful of the areas with large populations of fish because there may be brown bears feeding in those areas as well. No See Um Lodge accesses the most remote areas of the park via float plane. 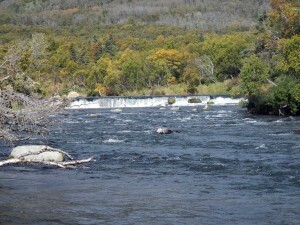 There are dozens of rivers and streams, many world famous for incredible fishing. Among the more well known that we frequent are the Moraine Creek, American Creek, Battle River, Kulik River, Brooks River and the Alagnak. The park is the perfect spot for an angler to fish for the day or for a family to see some of nature’s gems. Katmai National Park and Reserve is worth looping into your Alaska adventure in order to experience the spectacular Alaskan wildlife.